Following the tradition of the installation banquet in 1948, Zeta Beta has continued to hold annual and semi-annual banquets during the years. Brothers and alumni gather each year to celebrate the initiation of the new brothers, the accomplishments of the school year, and the continued success of Alpha Phi Omega on the Virginia Tech campus. 1951 Faculty dining hall, Mr. Carl Hildebrand, Assistant Scout Executive from Roanoke, was the speaker. 1957 Radford , Banquet honored Paul N. Derring, one of three Charter Honoraries. The speaker was William Blair. 1958 National President William Roth was present at the to install the newly elected officers. 1969 Dr. Walter S. Newman was guest of honor, and gave a talk on "The Value of a service Fraternity to VPI". 1963 15th anniversary, ZB extended Honorary membership to Tech's new President, Dr. T. Marshall Hahn, Jr. The Torch & Trefoil carried an article on this banquet in its May, 1963 issue. he was Commandant of Cadets at VPI. Speaker was Robert L. Bashore, ZB Scouting Advisor. Dr. M. P. Lacy, Tech's Dean of Admissions and Records. National Executive Board of the Fraternity, presented the Twentieth Anniversary Certificate. 1970 Lendy's, Speaker was Tech President Dr. T. Marshall Hahn, Jr.
1971 Lendy's, Dr. Rhodes B. Holliman, Professor of Biology and new Honorary member, was the speaker. 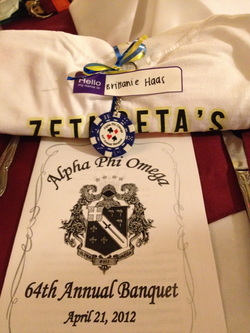 banquet by being named Zeta Beta Sweetheart, and was presented with a Sweetheart Pin. included: Rev. Al Payne, Dr. Leon Arp, and Dr. V. Ray Hancock. 1979-82 Various locations, including The Governor Tyler Hotel in Radford, Holiday Inn and Sheraton Red Lion Inn. Dr. Haney and Mrs. Haney. 1985 Sheraton Red Lion, Dr. Sandra Sullivan, Dean of Admissions, was the guest speaker. presented Dr. James Dean with the National Certificate of Appreciation at this banquet. 1987 Sheraton Red Lion, Dr. Stanley A. Huffman, original charter member and ZB Advisor was the guest speaker. 1988 40th Anniversary Banquet, Huckleberry Inn. 1989 Huckleberry Inn, Lorin Jurvis, past National President was the speaker. banquet. The attention flattered him, and he obliged the request. 1991 Tom Terrific's, Dr. James Dean spoke. Dr. Martha Roane was presented with the Distinguished Service Key. 1992 Red Lion Inn, Dr. Stanley Huffman received a Distinguished Service Key. 1998 50th Anniversary Celebration, Squires Commonwealth Ballroom. 1999 51st Anniversary Banquet, Owens Banquet Hall. Spring 2008 pledgeclass namesake, Jamie Conover Stewart, spoke to Brothers, Alumni, and guests. 2011 Holiday Inn on Price’s Fork, Black and White Attitire Theme, Jen Cease spoke. and Vice President of Friendship Annie Klein spoke. Namesake Karthik Subramanian and Zeta Beta Alumni Paul Louie. 2014 Holiday Inn on Price's Fork, Roaring 20s Theme. Guest speakers included Spring 2014 Pledge Class Namesake Ed Kist and distinguished alumni Dr. Hancock.